I saw a preview of Spider-Man so I am calling this a Re-piew. It is not a review, it is a Re-piew. A preview is that they haven’t made the whole show yet. It was in NEW YORK CITY! 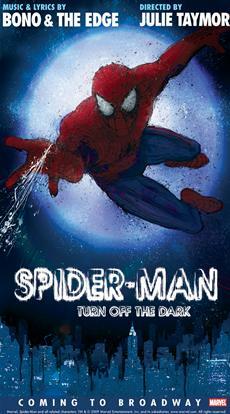 Once upon a time I went to a preview, and it was called Spider-Man: Turn Off the Dark. It was fighting at some parts and not fighting at parts. And sometimes confusing, and sometimes scary, and sometimes weird. I liked the funny parts and I liked the confusing parts quite a bit. The music was good--almost all the people were singing during the music. It was kind of rocking and kind of sad-ish. Spider-Man was played by Reeve Carney. I met him afterwards, and I got his autograph. It was awesome. I think he did a really good job playing Spider-Man. He did a good job swinging, and he wasn’t scared. And a good job grabbing things and a good job talking like something bad was actually happening. What his emotion was in the play made me feel the emotion. Peter Parker was the secret identity of Spider-Man. The person that played Spider-Man also played Peter Parker. I liked the character of Peter Parker quite a bit because he doesn’t always have to have a good time because he is a super hero. Ones that are treated nicer--then they can be happy all the time. Usually super heroes are treated nicely in their secret identity, but Peter Parker isn’t. Batman is very rich, but he has had a very sad life, and his parents died, and he hates Christmas because his parents died on Christmas. And Batman is kind of like Peter Parker a little bit because his parents died at a very young age and Peter Parker’s uncle died when he was very young for his uncle to die. Arachne (America Olivo) was like Arachne from the story of Arachne. It is a Greek story, a spider story, and a told story. She was a spider and she turned into a human at the end. She wanted life and freedom. She is in Peter Parker’s dreams. They wanted to put her in the play because they wanted to show Peter Parker’s dreams. It makes it like he is in love with Arachne but he is actually not in the story. That was not very clear to the audience. Her songs and dancing were cool, and she robbed a shoe store. I liked how she robbed the shoe store. The Green Goblin (Patrick Page) was scary in his costume, and he had a mask or face-paint. I think it was face paint because then how could you see his mouth move? And he had spikes on the outside of his costume on his shoulders. They were like shoulder spikes. It was pretty awesome. He did a good job playing the Green Goblin. Everyone clapped after his song which was very funny because it was about destroying New York. And then he said “Thank you, thank you very much” even that nobody in the play was actually supposed to be listening--which was so hilarious. Mary Jane (Jennifer Damiano) sang some songs with Peter Parker. For one song they were actually singing the same thing that everybody else on stage was singing. It was called “No More”--they were singing about that their life was so hard. Her performance was awesome, but her part that was made was not as good as she was acting--like she was doing a better job playing that than the part was. J. Jonah Jameson was played by Michael Mulheren. J. Jonah Jameson was against Spider-Man. I have no idea why he was against Spider-Man. But he should be against the Green Goblin, but he had no problems with the Green Goblin. He thought the Green Goblin was the hero and Spider-Man was the villain because Spider-Man was destroying things so he could save people. It was awesome because he acted like he hated Spider-Man, but the actor actually likes Spider-Man quite a bit because why would he ask to be in the musical if he really hates Spider-Man? These are some of my favorite scenes. There was this scene where Peter Parker was fighting with the kids that didn’t like him after he got his super powers. So he like came in and like punched two back and they were like hovering in the air in the back with their mouths open like aaaaaaaaaaaaaaaaaaaaaaaahhh! There was like a part in the scene where at the end everyone was hovering in the back like aaaaaaaaaaaaaaaahhh! And Flash Thompson ran away because he was very scared because he didn’t expect Peter Parker to have all these super powers. It was kind of funny. Peter Parker was strong and it was cool. I didn’t think they would be hovering in the back like aaaahh! There was this part where Spider-Man was fighting with Green Goblin, and he was flying around in circles, and Green Goblin scratched at the people at the top, and we were at the top, and it was very very scary. And then when Spider-Man came off from flying and webbing everywhere, and then when he was walking to go through the door, a kid who was sitting in the balcony chased after Spider-Man. It was very weird. Peter Parker was bouncing off the walls in the song and scene called “Bouncing Off the Walls.” It was very cool. The scene was cool, and he was like bouncing off the walls, and his house looked like it was falling apart. Some people were holding on to his house so it looked like it was falling apart. He woke up and then he just started bouncing off the walls because he had his super powers. I wish I was in that scene because it was so AWESOME. And I’ll sing the lyrics: “Bouncing off the wa-aa-aalls! Bouncing off the wa-aa-aalls! Bouncing off the wa-aa-aalls! Bouncing off the wa-aa-aalls! Bouncing off the wa-aa-aalls! Bouncing off the wa-aa-aalls!” They actually do it more than six times--more than one hundred, like a trillion. I said it six times so you would be prepared to be annoyed. There were some scary things that were in the play. There were villain projections that were very scary. I think that they wanted children to come see it, but they made it too scary for children. The ugly pageant was great. The ugly pageant was whoever was the ugliest of the villains winned the ugly pageant. They should have done more stuff like that because the projections were scarier than the ugly pageant. It was confusing that it looked like Peter Parker was marrying Arachne instead of Mary Jane because he asked Mary Jane to marry him. But then it looked like he was marrying Arachne. It was very confusing because everybody thought Arachne was only in his dreams. Very cool review. I want to see it now. Thanks! Please continue to get out there and enjoy live theatre as much as you can. And make sure to thank your mom for all her help! H! My name is Amanda, and I am the online editor of Bunchland.com, a website about the cool and fun things families do together. We do video movie reviews, and we'd love to have you shoot one for us! You can get in touch by emailing info@bunchfamily.ca. Hope to hear from you soon! Great job, Ada! I can't wait to read more of your reviews, and hope you are having fun doing this! Keep it up! Awesome review, Ada (or "re=piew"). Great job! far more astute and comprehensive than the reviews in the times. they should consider hiring you ada. Thank you for writing this wonderful review! It made me very happy to read it. I have written about Spider-Man as well but not nearly as entertainingly as you have. I think you are great and I hope you keep writing. Please thank your Mom for helping you write this stuff and taking you to nice shows. I hope you get a toy dinosaur or fox for Christmas. It sounds like Spiderman was even better than a play of a fox and a dinosaur -- even if they were fighting. And it sounds like you had a night to remember. Thank you, Ada. I really liked your review. You write very well. Thank you again! You are awesome! That is a fantastic review, Ada! You are a very insightful observer and eloquent reviewer. Keep it up and thanks! You are very funny. And I agree. I just bought tickets to Spiderman - Turn out the Dark last night and my friend sent me a link to read your re priew. Now I am even more excited to see it! It will be my first trip to NYC even though I am 51 (and that still makes me nervous) but I think seeing this Broadway play will keep me motivated. Thank you for sharing your experience with us! ADA! You are amazing. Your reviews are better than the Tribune! You should be very thankful to your parents for letting you experience the incredible world of theatre. Keep doing what you're doing!